When Israel used the Mirage to good effect in the opening strikes of the 1967 Six Day War, Dassault could not have asked for a more effective advertisement. Dassault's Mirage managed to corner a major share of the world wide market for first-generation mach 2 fighters, obtaining the kind of export success eluded by the British Electric Lighting or the Lockheed Starfighter. The name "Mirage" had become synonymous with "advanced fighter" and nation after nation placed orders for the type. With the Mirage, Dassault adopted a whole new configuration, a 60° tailless delta designed to promote climb and altitude performance in a fighter. Both the original non-afterburning MD. 550 Mirage (first flown in June 25th 1955) and the subsequent unbuilt Mirage II were austere twin engined designs, developed with the lessons of the Korean War in mind. Their design assumed that the formula of a radar gun sight, an IFF (Identification Friend/Foe) system and a radio would be sufficient for supersonic combat. This concept however, was soon abandoned for a better equipped and heavier aircraft. 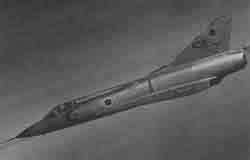 The Mirage III prototype, a private venture design powered by a single afterburning Atar engine, first took to the air on November 18th 1956, demonstrating a speed of Mach 1.6 within ten weeks. This led to a French Air Force order for the Mirage IIIA preproduction fighter which evolved into the Mirage IIIC production aircraft, the first delivered in October 1960. Numerous nations around the world have since operated the type, including Australia, Pakistan, South Africa and Argentina, which lost a pair of Mirages during the 1982 Falklands War. The "Shahak" (heavens), as the Mirage was known in Israel, was the first IAF fighter equipped with air-to-air missiles. It could carry both the French Matra 530 and the Israeli Shafrir I, but these were so unreliable that IAF pilots preferred using the twin DEFA cannons instead. While the first months in service were dedicated to extensive training, like all IAF fighters the Mirages were soon involved in combat. During the 1960s Israel had engaged Syria in what has become known as the "War for the Water", attacking Syrian attempts to divert Israel's water sources. On August 19th 1963, fighting once again broke out after two Israeli soldiers were killed in a Syrian ambush. In the Mirage's first engagement, a pair of 117th squadron fighters encountered 8 MiG-17s and managed to hit one, although it returned safely to base. On November 13th 1964 the first ground attack mission was conducted against Syrian artillery on the Golan Heights. Another first took place the following day when a pair of Mirages encountered Syrian MiG-21s. For the first time both the Mirages and MiGs launched air-to-air missiles, although no aircraft was downed. The IAF went into action again during July 1966 after Israeli troops were killed by a Syrian land mine. On July 14th Mirages were flying top cover for other IAF jets striking Syrian positions when 4 Syrian MiG-21s were detected approaching the battle zone. 4 101st squadron Mirages were directed towards the MiGs and the formation's no 4., Captain Yoram Agmon, managed to down one of the MiGs using his cannons. This was the first worldwide kill for the Mirage, as well as the first Israeli downing of a MiG-21 (kill marking on the right). Another MiG was downed over the Sea of Galilee on August 15th, after attempting to strike at an Israeli ship run aground. On November 11th 1966, three Israeli soldiers were killed by a land mine near the Jordanian border. During the subsequent retaliatory strikes, one Jordanian Hawker Hunter was downed by the "Atalef" squadron's commander. Two Egyptians MiG-19s fell prey to a single Mirage on November 29th after infiltrating Israeli airspace. One of the MiGs was downed using the Matra 530 air-to-air missile, the first IAF missile victory. April 7, 1967, is considered the day the countdown to the Six Day War begun. An incident that begun with Syrian shelling of Israeli tractors in an agricultural area escalated into shelling of Israeli settlements along the joint border. At noon, five IAF squadrons, including the 117th Mirage squadron, were ordered to conduct strikes against Syrian positions on the Golan Heights. The attack was broken off before being completed after Syrian MiG-21s were detected in the vicinity and the attacking aircraft retreated to make room for Mirages from the 101st "first fighter" squadron to engage the MiGs. In the ensuing dogfight, two MiGs were downed over Damascus. At the same time, more MiGs were detected over the southern Sea of Galilee but managed to elude interception by Mirages from the 117th squadron. When Syrian shelling of Israeli settlements resumed at 14:45, the IAF once again went into action. As before, Syrian MiGs attempted to disrupt the attack and once again had a MiG-21 downed, this time by a 119th Mirage. At 16:30 6 Mirages on patrol over northern Israel encountered 4 more MiG-21s and managed to shoot down 3 of them, bringing the day's total to 6 aircraft. IAF Mirages are best known for their conduct during the 1967 Six Day War. Mirages spearheaded the decisive pre-emptive strike against Arab airfields, operation "Moked", decimating Arab air forces, and completely overwhelmed the few enemy aircraft that survived to challenge the IDF. Israel entered with war with 65 airworthy examples and all but 12 participated in the strikes launched on the morning of June 5, 1967. Four by four, the entire IAF fighter inventory descended on Egyptian Air Force bases, destroying the majority of its aircraft on the ground. Mirages, the IAF primary fighter of the war, were tasked with attacking the farthest and best defended air bases: Abu-Sweir, Cairo West, Helwan and more. When operation "Moked" was turned against other Arab nations, Mirages were once again in the forefront of the fighting, attacking Jordanian, Syrian and Iraqi air bases as well. Having destroyed dozens of enemy aircraft during the first day's activities, 4 Mirages were also lost. More Mirages were lost during the remainder of the war, one of them in a disastrous sortie against Iraq's H3. By the end of the war, Mirages had also shot down 48 Arab fighters, some of those aircraft that had survived the initial strikes. The "Shahak" has also been credited with keeping Lebanon out of the war by downing a Lebanese Hawker Hunter near its border on the morning of June 5. The amazing victory achieved in the Six Days War did not bring about an end to fighting between Israel and its Arab neighbors. The War of Attrition that broke out shortly after the end of the war raged until 1970, providing a lot of activity for the various Mirage squadrons. The most volatile front of the war was the Egyptian front, pushed back from the former border across the Sinai desert to the Suez Canal. In order to deal with the increased distance to the front, Mirage squadrons begun deploying to the former Egyptian air base at Bir Gifgafa, renamed Rephidim by the IAF. The first IAF post-war kill occurred on July 8th, when "Atalef" squadron Mirages shot down a MiG-21 attempting to disrupt IAF operations against Egyptian artillery. Six more MiGs were shot down on July 15th, including the first Shafrir air-ro-air missile kill. Another Shafrir kill took place on May 29, 1968, when a "first fighter" squadron Mirage downed a Syrian MiG-21. Mirages had also occasionally flown ground attack missions, but the advent of the A-4 Skyhawk in the IAF rendered this unnecessary and from August 4, 1968, they were solely confined to interception missions. Although fighting had taken place regularly since the end of the Six Day War, the War of Attrition officially begun only on March 3, 1969, with an Egyptian declaration of the cancellation of the 1967 armistice agreement. This declaration signaled the beginning of a major escalation in the fighting, with increased Egyptian Air Force activity in the Suez Canal zone and the introduction of larger numbers of Soviet SAMs to hamper IAF operations. The years 1969 and 1970 saw extensive combat along the Suez Canal, with repeated attacks by both the Egyptian and Israeli air forces. Mirages took part in the majority of 97 encounters between Israeli and Arab fighters of the time, downing a large number of aircraft. The first kill by the new Shafrir 2 AAM missile took place on June 24th 1969 by a "first fighter" squadron Mirage. Eleven Egyptian MiGs were downed on September 11 alone, while dozens more were shot down by the official end of the war on August 7, 1970. Probably the best known encounter of all occurred on July 30, 1970, when IAF Mirages and Phantoms shot down five MiG-21s flown by Russian pilots, of which three were Mirage kills. Skirmishes between Israel and Syria resulted in downed Syrian jets as well, among them 4 Syrian MiG-21s downed on December 11, 1969. Much as on the eve of the Six Day War, the Mirages were also involved in the prelude to the Yom Kippur War. On September 13, 1973, four Israeli F-4 Phantoms were on a reconnaissance mission over north-western Syria when 16 MiG-21s were launched against them. In what has since been speculated as an IAF ambush, the F-4s lured the MiGs over the Mediterranean where more IAF jets were on patrol, including 8 Dassault Mirages. During the initial fighting 8 Syrian MiGs were downed, while Israel suffered a single Mirage loss. More dogfights took place during the subsequent rescue attempts, and 4 more MiG-21s were shot down. By the outbreak of the Yom Kippur War on October 6, 1973, attrition had worn the Mirage fleet down to 40 examples. Two IAF squadrons were equipped with the Mirage during the war : the 117th "first jet" squadron and the 101st "first fighter" squadron which also operated the IAI Nesher. Operated as a dedicated air superiority fighter, the Mirage enjoyed great success during the war, scoring numerous kills. The early days of the war were spent patrolling Israeli airspace against possible attacks on Israeli cities and installations. During one such patrol a Mirage shot down an AS-5 Kelt missile launched from an Egyptian Tupolev Tu-16. On the third day of the war, Mirages managed to take off from Rephidim in the midst of an attack by 4 Egyptian Su-7s, and shot down the entire quartet. On October 24, the last day of fighting between Israel and Egypt, a large dogfight involving 8 Mirages and 12 MiGs took place over Egypt. 7 of the MiGs were shot down, while all Mirages returned safely to base. Giora Epstein, the IAF's alltime top scoring pilot (with 17 victories), managed within a single week between October 18th and 24th to down 12 Egyptian jets while flying a Mirage. On one single sortie he managed to shoot down 4 aircraft, while on another he shot down 3. By the war's end the IAF had lost 12 Mirages. The decreasing number of Mirages with the IAF and the arrival of newer fighters, first the F-4 Phantom and then the F-15 Eagle, made the Mirage irrelevant. The type continued to serve with the IAF until 1982, and although the remaining Mirages were prepared for possible use during operation "Peace for Galilee" in June 1982, they nonetheless did not participate in the fighting. A single airworthy example, Mirage no. 59, still resides in the IAF Museum at Hatzerim (photo above). This is the aircraft that had downed the first Syrian MiG-21 on July 14, 1966, and also the IAF's top scoring aircraft with 13 aerial victories. This achievement is shared by only two more aircraft: One is another Mirage IIICJ (no. 58) while the other is an IAI Nesher (no. 510), itself a Mirage derivative. Type: single seat interceptor and gound attack fighter. Powerplant: 1 * SNECMA Atar 9C afterburning turbojet. Performance: max speed - Mach 2.2, service ceiling 17,000m, range - 1,350km. Weights: empty - 5,915kg, max takeoff - 12,700kg. Dimensions: span - 8.22m, length - 14.75m, height - 4.25m. Armament: 2 * 30mm DEEFA cannons plus up to 2,268kg of disposable stores carried on one underfuselage and 4 underwing hardpoints.